Paul Cox Panel and Paint are an accident repair centre based in Wellingborough, having recently relocated from Northampton. Established in 2003, their aim is to carry out high quality repairs to all car body types. Recognising a niche in the market, Paul Cox have now also opened a specialist coatings department, enabling them to paint wood, glass, metals along with many other surfaces. 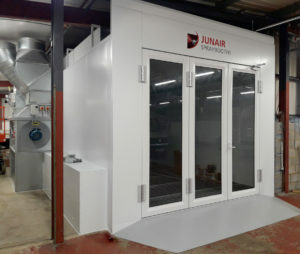 Priding themselves on providing the highest quality repairs and using the best technology on the market whilst also being environmentally friendly, Paul Cox turned to Junair to find out more about their new state of the art spraybooth. Our team recommended the 3 series booth which has a fully gridded floor, offering a downdraught airflow. A downdraught airflow is the optimal method for removing overspray and ensuring the best possible finish to the paintwork. With the diverse range of surfaces that Paul Cox sprays the quality of the finish is of paramount importance. The limited height of the bodyshop meant that a roof mounted plant was out of the question. 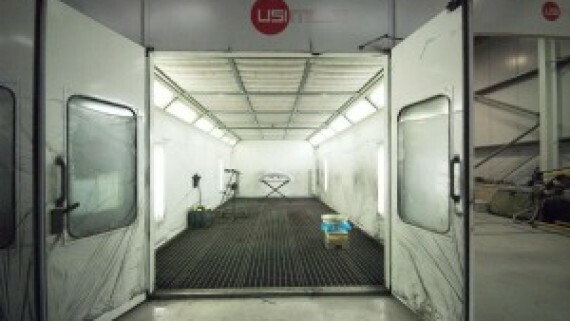 In addition to this, the steel framework within the bodyshop limited the positioning of the burner and plant. 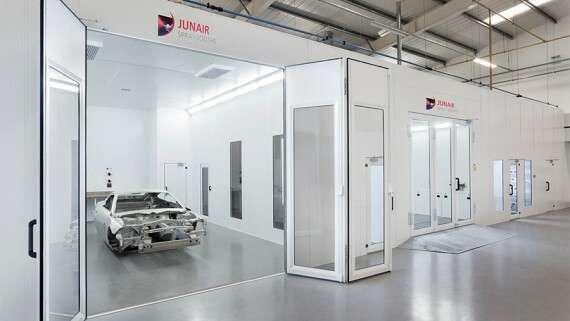 The Junair design team therefore came up with a strategy that could meet all of the buildings restrictions whilst allowing a second booth to slot in alongside the first should they need one in the future. The spraybooth was situated between steelworks and the plant was mounted on the extraction chest at the side of the cabin, keeping both the height and footprint to a minimum. 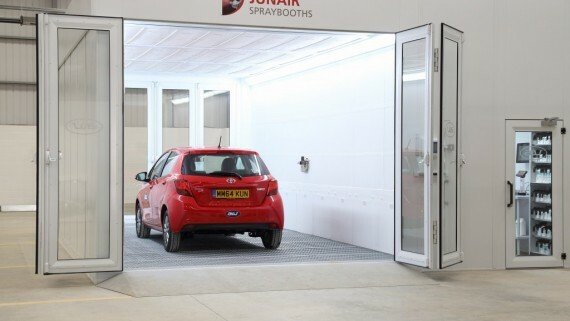 In order to avoid the excavation works associated with a floor extracted spraybooth, Paul Cox opted for the Junair LEVAC floor. The booth is raised by just 140mm and can be accessed via a small ramp. 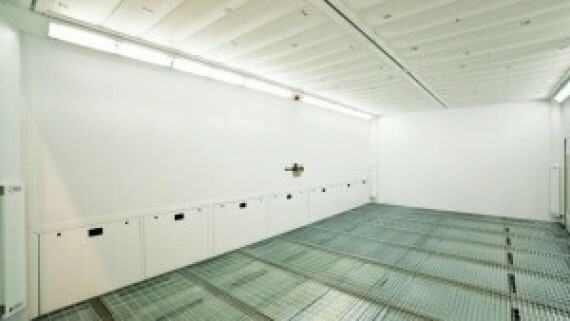 This allows for a full downdraught spraybooth without the need for floor excavations. Paul Cox opted for the full energy saving pack including Fuel Saver Mode, Variable Speed drives. 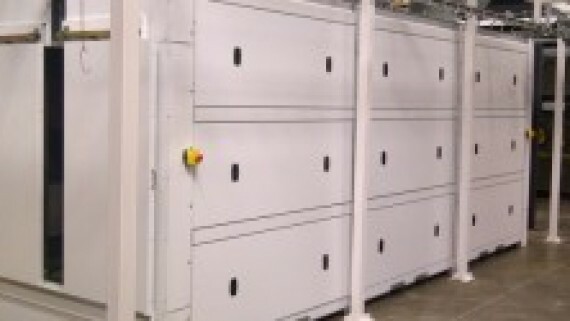 LED lighting, and QADs auxiliary drying system. 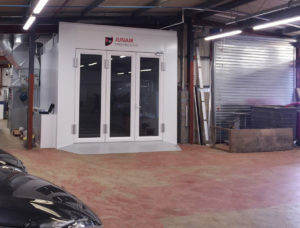 These additions are not only better for the environment but as they are energy efficient, the costs of running the spraybooth will be reduced by 70%. For more information about the Junair range of Spraybooths and ancillary products visit the Junair website, email sales@junair.co.uk or call our experienced team on 01706 363 555. You can also contact us online for a call back at your convinced.